Illustration courtesy of Brackish Co. When you’re old, you’re cold; or at least that’s the way it is with me. Whether in the deer stand in late season or out on the lake in the canoe hunting ducks my hands, feet, ears and neck get cold, so I’m always looking for new and innovative products to keep me warm. By great good fortune a fellow member of our local Lions Club is also the CEO of Brackish (www.brackishco.com), a small company that designs and markets equipment, clothing and accessories for the snowboarding sport. Due to the fact that his family has a long and extensive history of hunting, Lynwood also specifies some of his products in blaze orange and camouflage. The professional snowboarders who use this clothing and accessories often hurl down mountains at 60mph or better in frigid temperatures and their gear and clothing has to work in these extremes. Those parameters work just fine for us hunters, as well. The beanie is constructed of a dense space age polyester material with ample room for the head and more than enough fabric to pull down over the ears. It traps heat from you head and blocks the wind. The neck wrap is even more innovative. It pulls down over your head to cover the neck and can be pulled up over the mouth. The fabric is light weight and sheer enough to breathe through, yet it’s constructed to block the wind and provide a degree of warmth. 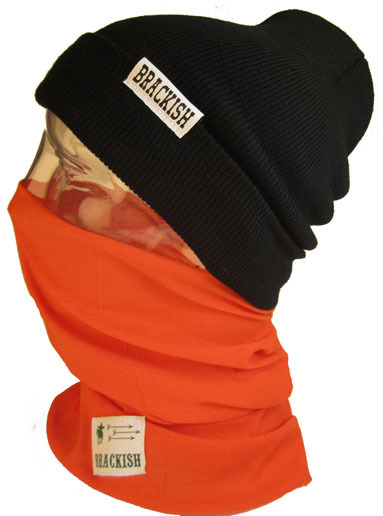 I bought the blaze orange beanie and neck wrap last season. I used them in conditions below freezing and in winds above 10 MPH, in deer stands or sitting on a log. These products worked so well that I purchased a blaze orange beanie and neck wrap for my nephew for Christmas. His father liked Drew’s neck wrap so well that he asked me if I could get one in camouflage and I bought one a few weeks ago for his birthday. This year, I’m acquiring the camouflaged version of both products for duck hunting. Check-out the web site or contact Lynwood personally (lynwoodcherry@gmail.com) and enjoy staying warm and having an extra degree of comfort next season. Copyright 2013 by Jim Force and/or chuckhawks.com. All rights reserved.